Hip Hop – bit of fun . . If you’re one of those guys into fashion, you’ll always be on the lookout for a watch that you can mix and match colors and so on, just so you’re in the groove so to speak. And the Italian Brand Hip Hop is probably a good choice. 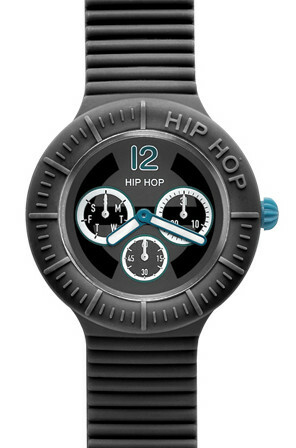 The model I prefer out of the whole range is this one – the Hip Hop HWU0177 Black Tie model. It’s larger than most of their range at 42mm with the usual plastic/rubbery case with attitude and this has the Calendar analog module Miyota Quartz movement, so is pretty good in operation. It shows Time, Seconds, Date and Day of the week with it’s sub-counter dials. Color scheme is interesting and the hour and minute hands are bright white infilled with touches of blue reflected in the Crown and the 12 numeral. Water resistance is 5 atm. Where it scores fashion wise is that the complete movement is held within a secondary strap/case which can be popped out of the surrounding rubbery one, allowing it to be fitted into another outer case. The case/straps are interchangeable so this is really a fashion accessory as much as a watch. Been around in Italy since 1984 and still here so they’re obviously doing something right. Now OK this is perhaps not what serious watch collecting is all about, but it’s a bit of fun and with the Miyota movements inside are as solid and reliable as you’ll get – so why not? There are a few mix and match fashion watches around, but this one for me is one of the better efforts – I like it especially as it is a decent size. A single watch like this costs around £30-£40 ish and you can add to this of course, so watch how far you go before it becomes unfashionable wallet wise!